A blend of smooth grooves and catchy melodies, A refreshing walk through the smooth jazz genre. And an award winning producer/engineer. That's a lot of hats to wear, but Forward Music artist Jeff Friend wears them well on his new EP release "It's Not What You Think". A blend of smooth grooves and catchy melodies, It's Not What You Think is a refreshing walk through the smooth jazz genre. This first solo project has been a long time coming for Friend. "I've been wanting to do this for years," he muses. "I just never took the time." Although this is Jeff's first solo effort, he is certainly no stranger to the music business. Working behind the scenes in urban Dayton Ohio, Friend has been writing and producing for well over two decades. In the mid eighties, Jeff wrote the top 20 Billboard dance hit "Putting the Night On Hold" for Dice Records artist Lauren Grey, followed with "Irresistible Love", and then "Destiny", a duet for Leah Landis & Lauren Grey. Jeff continued honing his writing and production skills in the advertising market, writing and producing music for a number of Telly award winning national, regional, and local commercials. His compositions have spanned every style and genre of music imaginable, and he has even worked with such notables as trumpet great Doc Severensen, and guitar legend B.B. King. "My hope, is that just one of these songs touches somebody somewhere," Friend concludes. "If that should happen, then the whole project was worthwhile. Same great chops... entirely different head... Smooooooooth! This CD offers a wonderful sampling of sounds and rythms. Incredible artistry and dynamic production. A great collection of jazz for the serious audiophile. Drum solo on Track 6 is a delight (reminds me of Buddy Rich/Gene Krupa styles). Positive vibes throughout. It's Not What You Think... IT'S BETTER!!!!! It's Not What You Think... IT'S BETTER!!!!! A serious groove... smooth without being pedestrian... Friend is replete with talent. Makes a flawless transition from keyboards to drums. From the mainstream sound of AND THE RAIN FALLS to the Methenyesque BIAHYA, he has the chops! Lovely, knowing work by Matt Warner on sax! Kirk Smith and Bruce Clingan add the perfect ingredient each time to this sassy stew! Dowden is liquid and funky... you try it!! Buy this CD! It may be the only time you don't speak the words..."I liked them all except"... No exceptions! It's Not What You Think is GREAT FUN!! Apparently you CAN be ALL THINGS TO ALL PEOPLE!! Apparently you CAN be ALL THINGS TO ALL PEOPLE!! It's Not What You Think will take you full circle... enjoy the trip! You can drive... get a massage... workout... and relax to this CD. That just doesn't happen! It fits everywhere!! This is one slick, cool CD! This is one slick, cool CD! The Ohio-based drummer has hit a home run with IT’S NOT WHAT YOU THINK. The first song on the album, “Too Many Cars” was the last tune written for the project. An upbeat, R&B tune with retro hook ala “Green Onions”, with cool traffic sound effects making for a fun listening experience (maybe not while you’re driving). “Smoothie” has the Smooth Jazz signature all over it with super sophisticated sax and trumpet work and is currently a Smoothjazz.com Radio Hot Pick, be sure to listen for it. On Jeff’s website, he says that this song was inspired by Sade, not so much her sultry vocals, but her band's ability to groove. Another stand out tune on this delightful release is “The Copycat”, with its breezy stride and hip trumpet playing. IT’S NOT WHAT YOU THINK offers a mix of smooth jazz and progressive jazz. In other words, there’s meat on the bones. And where’d he get that album name? 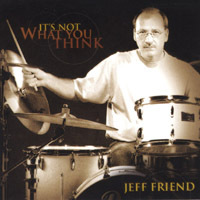 Jeff claims that those who know him and his rock background may expect his recorded music to be something other than this… Which is rich, melodic jazz. Well, now that we know Jeff Friend, we think he’s right on the money and we hope to hear many more great works in the future that continue to surprise us! I gotta tell you that I am just knocked out with this disk! I gotta tell you that I am just knocked out with this disk! Just can't seem to get away from it ... such a listening treat! Just beautiful progressions that catch the ear at every turn! The production, mix, and everything is just so very warm and pro sounding. You composed quite a piece of work here ... and all aspects are squeeky clean and well thought out. "Kinda like Bob" is getting replayed many times on my PC. I really dig that piece! The title track is radio worthy also ... very inventive and catchy. You never get bored with it ... something new around every corner. Hey, I love em' all! This is a great cd made by a long-time great talent! From the playfulness of "Too Many Cars" to the driving beat of "It's Not What You Think", every track on this disc is a '10'.